Using of the cryosauna in the fitnesses clubs will promote efficiency of physical trainings. Short-term preliminary cooling in the cryo chamber result in increasing of ability to transfer loadings. Preliminary sessions in the air cryosauna facilitate performance of physical exercises, raise perspiration threshold, reduce electrolyte losses during intensive activity. Besides cold influences beneficially on restoration after trainings. 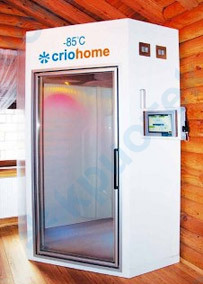 Air cryosauna Criohome ® can take a worthy place in a number of services provided in the Wellness, SPA and Fitnesses centers, and demand for this procedure, undoubtedly, will raise competitiveness of the health improving institution.